Keep Your Cough Calm and Carry On! While I would love to be celebrating this lovely Leap Day bounding about town with the convertible top down, it’s raining, I don’t have a convertible, and I do have a cold! Luckily, we’ve got quite the cough drops assortment here at Blair Candy, so my coworkers aren’t troubled with hearing my slightly pathetic coughing all day long. Do I feel sorry for myself when I have a cold? Oh, you bet your Kleenex I do! But why suffer at home alone when I can come to work and give everyone ‘please feel sorry for me’ puppy dog eyes? Besides, they wouldn’t know what to do without me! That’s what I tell myself, anyhoo. 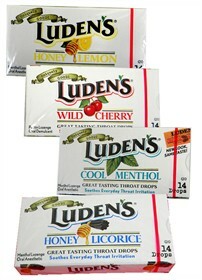 And, this is just your run of the mill cold so common this time of year, so I best be saving my sick days for more serious symptoms and let my Ludens cough drops help me tackle my tasks. Ludens Cough Drops – While I’ll gladly take any cough drop I can get when I feel that ‘cough is coming’ tickle, Ludens have been a favorite since I was a kid. 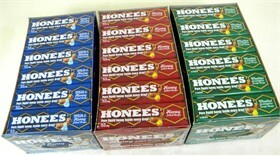 The Wild Cherry flavor is my top choice, with Honey Lemon following close behind. Cool Menthol is a good option for times the cough is kicking things up a notch, and Honey Licorice reminds me of something my Grandma might have loved. All in all, you can’t go wrong with candy-like Luden’s, but only Wild Cherry has my heart! 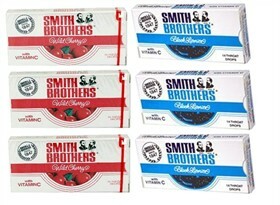 Smith Brothers Cough Drops – These cough suppressant wonders trace their beginning back to 1847! Our customers have given them a 5-star rating, and we understand why. Quite simply – they work! Alyce, a reviewer of Smith Brothers cough drops, notes, “These cough drops work better for me than any other brand. 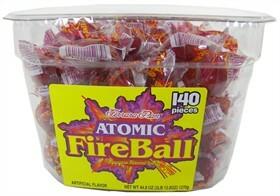 They do not leave that lingering after taste so many other brands leave in your mouth and throat.” Do you find most cough drops you’ve tried leave an aftertaste? Maybe it’s time to trust the Smith Brothers with your cold! Encourage Your Children to Do Their Chores with St. Patrick’s Day Candy! I can still remember a much younger me sitting at my grandmother’s kitchen table sipping Ginger Ale and re-reading that blessing again and again. I didn’t realize at the time that work was a blessing unto itself, but I knew that I loved the little treats high honors on my report card brought! So I worked hard then, and I work hard now, and I’m lucky that my purse always holds a coin or two. While we can’t expect young children to inherently understand the value of work, the time will come when teaching them is essential. There are countless ways to encourage your children to work hard in all they do, and just as many ways to reward them for it. This isn’t to say they deserve a prize for every dish they wash, but little presents here and there are fun for everyone. After all, you probably wouldn’t show up as often for your job were it not for the paycheck! With St. Patrick’s Day approaching and “The Luck of the Irish” on our minds, we thought up a fun, festive way to help your kiddos cross some chores off their ‘to do’ list while earning some magical goodies! 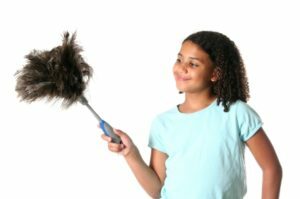 Step One: Choose a Few Chores to Reward – The number of chores will depend on how many they have, but let’s imagine they include Dusting, Making their Bed and Vacuuming. Jot these down in a notebook, and move to Step Two! Step Two: Get Ready to Channel Your Creative Side – The Irish Blessings we all know and love didn’t write themselves, and neither will yours! Don’t worry; this is designed to be fun. Think of the chore at hand and write a little 4-line blessing to give your child a clue at the prize. Let’s assume you will reward them with Green Apple Tootsie Frooties for dusting the living room. Your Irish Blessing might read: None of us like to live among dirt and dust, And this is what makes regular dusting such a must! But fret not for when you have finished your dusting duties, Your taste buds will be rewarded with Tootsie Frooties! OK, to be fair, it’s more of a poem than a blessing, but it’s close! Step Three: Decide How Magical You’ll Be – Now you’ll have to decide how to gift the goodies. You can always let your child know beforehand that their chores will come backed by treats this week, sharing the Blessings with them, and handing the candy out upon completion. Or, you can make it more magical, which works especially well for younger kids, but can be fun for teens as well. For the magical angle, it will be a bit like a treasure hunt. Let’s take the chore of vacuuming as an example. You can first take the vacuum from the closet and have it ready for them to use. Then, you can place the candy prize in a bag in the spot where the vacuum lives. Once they’ve finished and are ready to tuck it back into the closet, they’ll open the door to reveal their riches! Were they left there by a little Leprechaun? That’s up to you! Calling all chocolate lovers; you’ll love all you can do with Chocolate Gold Coins for St. Patrick’s Day! Whether you feel like baking a St. Patty’s surprise or you’re rounding up activities for the Irish holiday, chocolate coins make a delicious and entertaining candy of choice! Host a treasure hunt. Create a treasure hunt throughout the house where children can find shamrocks, coloring books, or other fun items. Place a pot of Chocolate Gold Coins for St. Patrick’s Day next to the final hidden item on the list. Pot O’ Gold Party Favors. If you’re looking for a fun and adorable DIY party favor, here you go. Drop about ten coins into a clear cellophane gift bag. Fill the rest of the bag with rainbow Twizzlers, colorful jellybeans, or a Rainbow Whirly Lollipop behind the coins. Seal with a label that reads, “You’re my pot of gold at the end of the rainbow!” Voilà! You have your very own rainbow in a bag. Leprechaun’s twist on traditional Hershey Kiss Cookies. Peanut butter thumbprint cookies with a Hersey kiss in the middle always make a delicious party dessert. Put a pot o’ gold twist on the traditional cookies by placing a bare chocolate coin in the center of the baked cookies. Lucky Cupcakes. Make you favorite chocolate or vanilla cupcakes and decorate them with a mound of green icing. Leave the coins in their gold wrapping and place one coin on each of the cupcakes for a dessert fit for a Leprechaun! Lady Luck Décor. 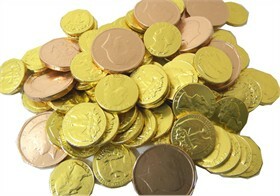 Spread chocolate gold coins over a green table cloth on the dinner or dessert table. The coins make a splendid after dinner chocolate or a delicious addition to guests’ dessert plates! These activities, baked goods, and décor ideas using Chocolate Gold Coins for St. Patrick’s Day are perfect for the classroom, family party, or a get together with your friends. It’s amusing to use your creativity and celebrate the luck of the Irish! We’ll always be grateful to Nello for the delicious treats he brought to the candy dishes of our past and present, but are most moved by what a fantastic person he seemed to be. We’re sending warm wishes to his family and friends in this time of loss, and hoping the wonderful memories and strong family connection that was so important to Nello will bring them peace.